The American Pharmacist’s Association building is one of a number of monumental headquarters that line Constitution Avenue in Washington, DC. 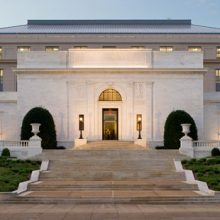 This classically-inspired building was completed in 1934, designed by John Russell Pope. 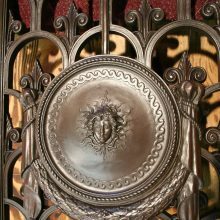 The building’s white limestone façade is enlivened by a series of fleur-de-lis cast bronze grilles. 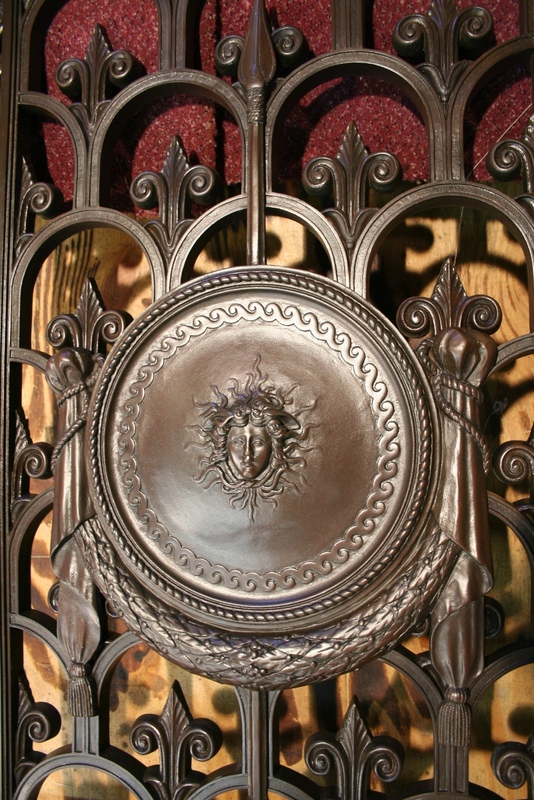 A large lunette crowns the front entrance; the entrance is flanked by a rectangular grille on either side, each adorned with a medallion featuring the head of Medusa. 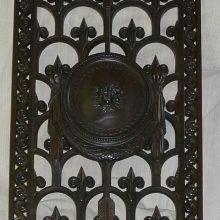 The grilles exhibited weathering and wear consistent with decades of exposure. Atmospheric soiling had accumulated and a layer of blue-green corrosion had developed across the surface, typical of corrosion seen on outdoor bronze elements. Some of the mounting flanges were damaged and trim was deformed. 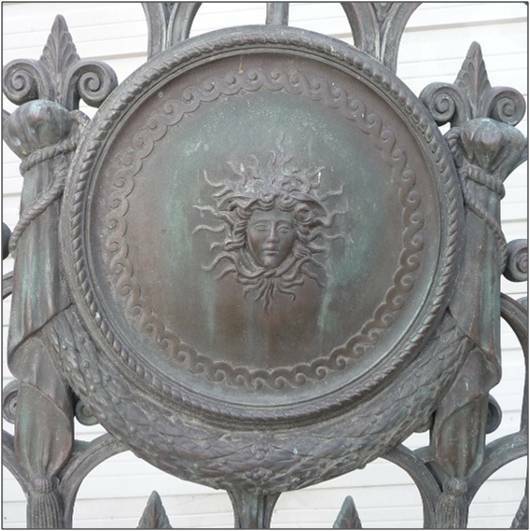 The client determined that the existing finish was not historically accurate or appropriate, and the metal should be refinished to a “Statuary Brown,” typical of new bronze castings. 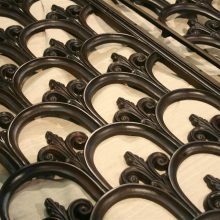 We were contracted in 2008 to restore the grilles. 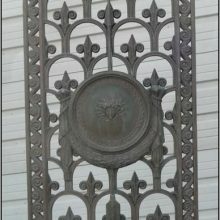 The grilles were removed from the building by others. Soiling and corrosion were removed through a combination of power washing, mechanical cleaning by hand, and micro-abrasive blasting. Minor mechanical repairs were made as necessary to ensure safe reinstallation. An appropriate finish color was developed and approved through mock-ups and discussions with the client. The grilles and all related hardware and trim were chemically patinated using a hot-applied solution of liver of sulfur. 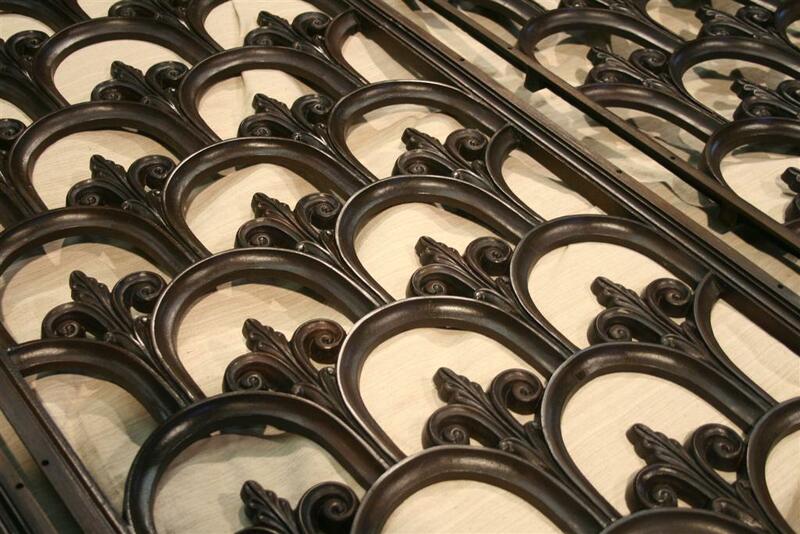 Each element was coated with spray-applied lacquer and tinted as needed to ensure consistency in the final color. Finally, all elements were coated with a layer of paste wax, a protective coating which can be field-maintained.